This weekend I had a healthy dose of nature, kayaking and biking in Northern Wisconsin. I tried to soak up the sounds, colors and scents as I enjoyed spending time with my family. I noticed dozens of shades of greens in the ferns, trees and flowers. 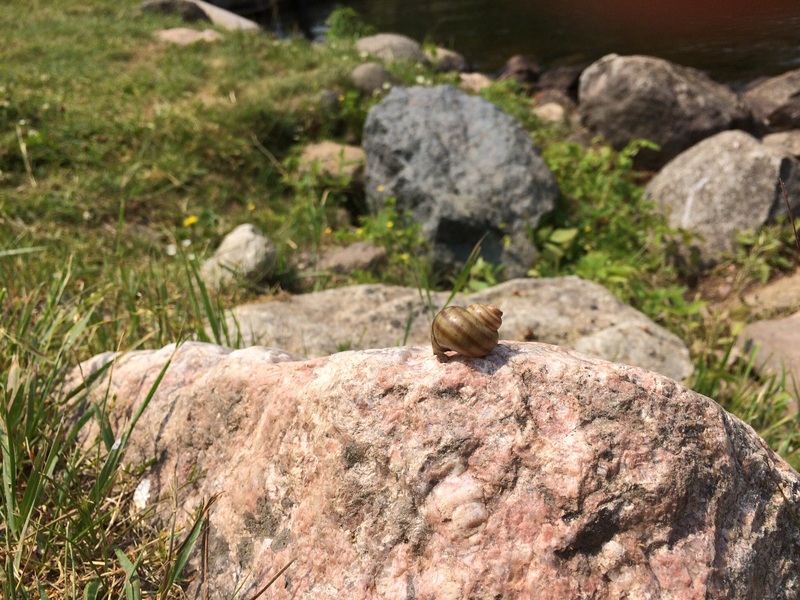 My daughter pointed out a small snail making its way on a rock. We raced a turtle in our kayak. So many of us shut out the world by putting on our headsets, moving like zombies through our lives, staring at handheld devices, never even noticing the extraordinary, ordinary life all around us. Regrettably, we can do the same thing at the piano, practicing mindlessly, not hearing or attending to the sounds that we are making. One of my former teachers, Charles Fisher, used to say, “You reap what you sow.” In other words, if you don’t pay attention in the practice room, that’s exactly what you’ll sound like when you perform. Most of us are guilty of sometimes taking the easy way out: going through the motions, trying to learn notes as quickly as possible. We forget to notice. We think we are accomplishing a lot through mindless repetition. The sad thing is that we are practicing without joy and without “showing up.” We are missing out. We are not paying attention in a mindful way. In The Positive Pianist: How Flow Can Bring Passion to Practice and Performance (https://global.oup.com/ushe/product/the-positive-pianist-9780199316595;jsessionid=27B45564F08AEB999A0D1E91D7C8B825?cc=us&lang=en&amp;), Thomas Parente invites pianists to honor the artist within and foster the emergence of flow while practicing, performing and teaching. Applying Mihály Csikszentmihályi’s groundbreaking theory of flow, Parente emphasizes the importance of doing what you love and the power of intrinsic motivation. He models how to practice using processes that create the ultimate state for learning: identifying goals that are at a level slightly above one’s existing skill level, achieving a high level of concentration while excluding extraneous thoughts, clarifying goals, eliminating fear of failure and loss of control, altering perception of time, and merging action and awareness (Parente, 17-18). This type of clarity of goals and critical self-knowledge can help us achieve task immersion and flow while practicing. According to Csikszentmihályi, it takes 20-30 minutes for a flow state to emerge. So turn off the text alerts, power off, and engage.